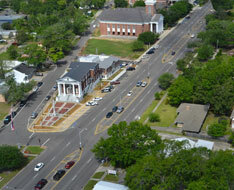 Businesses in the city of Picayune have the ability and flexibility to grow with the city. Currently, our yearly budgets include continuing improvements to provide adequate water, wastewater, storm water, solid waste, and recycling facilities to support the current and future needs of the growing population. The largest city in Pearl River County, Picayune is approximately 17.98 square miles. Picayune is conveniently located, 45 miles from New Orleans, Louisiana, Hattiesburg, MS, and the Gulfport, MS. The elevation in Picayune ranges from 36-feet in the southern section to 95-feet in the northeastern portion above sea level. One of the main characteristics of Picayune’s elevation is the nearly level, low-lying flatwoods areas. Drainage in this area moves slowly with nearly level soils to gently sloping. The best drainage soils are in narrow strips at slightly higher elevations along streams and low ridges through the flatwoods. Being centrally located and with continued improvements, Picayune is the perfect place for any commercial or agricultural business to thrive.